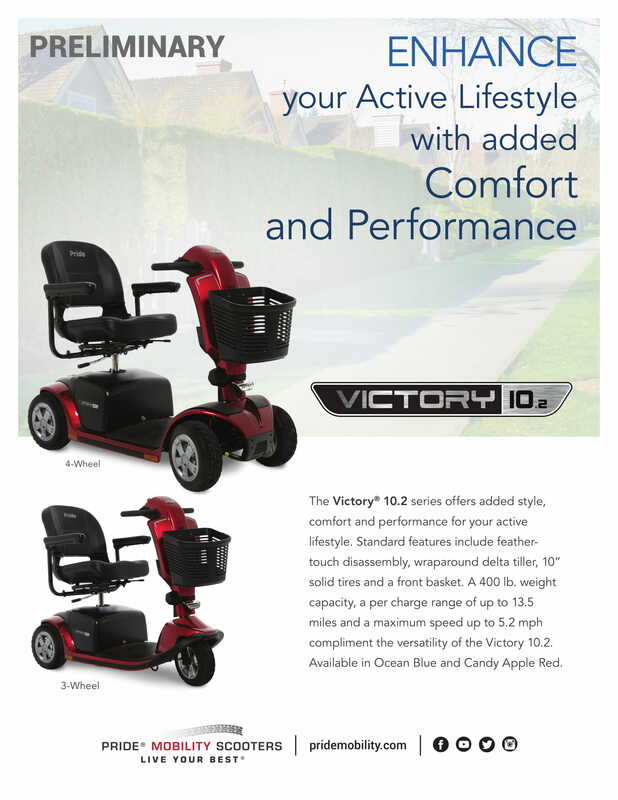 Pride Mobility has made the Victory 10.2 even better with innovative features sure to impress. Built in cup holders, additional storage and charging ports, the modern tiller is the ultimate in convenience for end users and caregivers alike. An ideal scooter for taller individuals wanting a smaller, more mobile option. With the high weight capacity, the mobility scooter is designed for multiple body types. 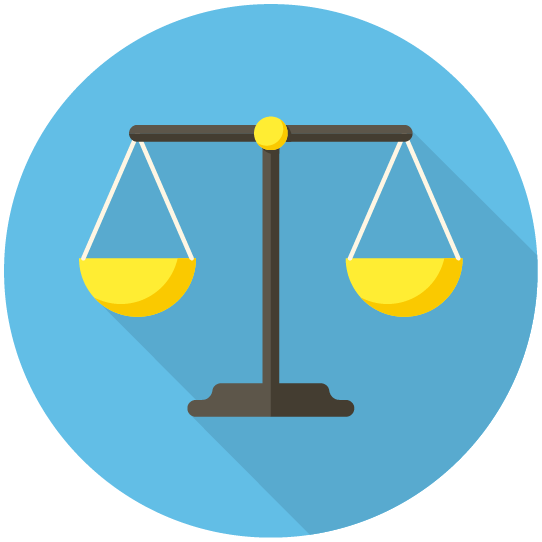 Seat width options are available in 18 or 20 inches. The seat is completely adjustable allowing the user to move forward or backward or turn to get on or off. Slide forward to reach the tiller more comfortably then slide back and swivel the chair to dismount with ease. With a 360-swivel radius, the scooter allows you to reach what you need in the comfort of your seat. Drive wherever you want to with the support your body needs. 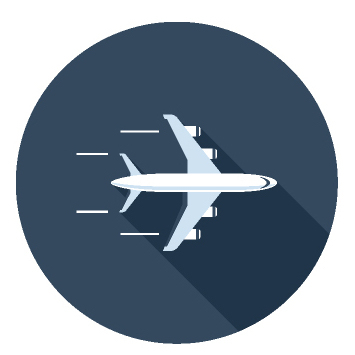 The tires are flat-free and non-scuffing perfect for indoor and outdoor use. The scooter disassembles easily for more convenient transport. Outfit your home with a threshold ramp and consider a scooter lift to make transportation easier. 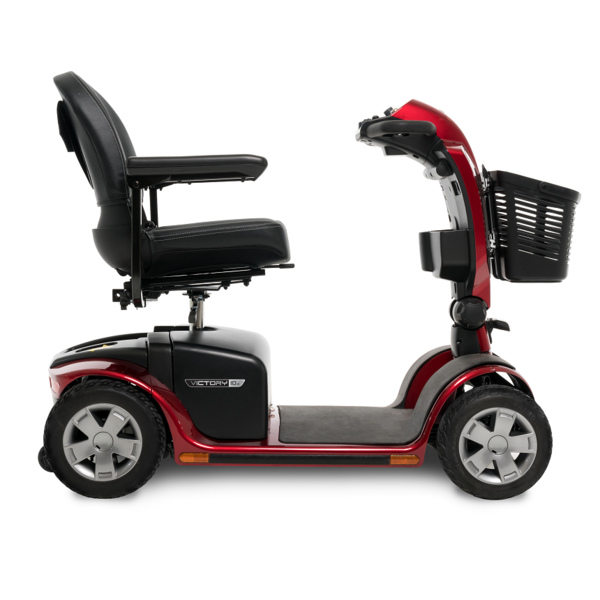 Pride Mobility: Mobility Victory 10.2 4 wheel has a rating of 5.0 stars based on 4 reviews. 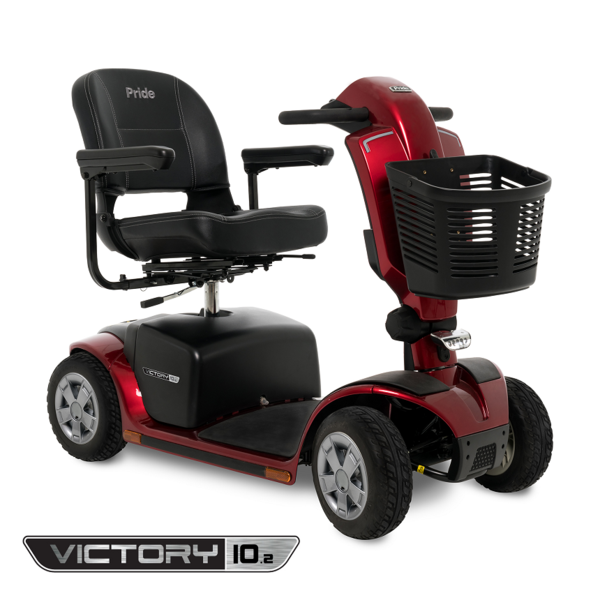 Why Pride Mobility Victory 10.2 4 wheel? The latest updates to the ever-popular Victory line from Pride are here! Pride has redesigned the Victory to accentuate its already great style with some new features to enhance its performance. The new modern tiller brings you the convenience of an additional storage area and built-in cup holders. The tiller improvements also includes a handy USB charging port to charge your cell phone while riding around during a busy day. New frosted LED headlights will focus on the path ahead to help guide you on your way. The sturdy and stable Victory 10.2 4-wheel is one of the few scooters in its price range with a generous 400 pound weight capacity to accommodate more users. The standard seat slides forward and back like an automobile seat would, allowing you to adjust to your perfect position. Additionally the seat swivels 360 degrees for easy on and off access. The seat swivel has the ability to lock at each 90 degree interval for easily entering and exiting at any direction.